I came across Angie and David Unsworth whilst browsing the lf-photo.org.uk forums. Someone had posted a link to a Cumbria newspaper (the Westmorland Gazette - link) which featured a photograph of a couple using a 10x8 camera. Being a bit of a large format junkie (and I am starting to include more digital photograpy into the magazine and my practises - bear with me) I couldn't resist chasing this one up. I paid a visit to their website (Greenburn Publishing) and was delighted to see more than just the usual Lake District snaps and also much more than just the usual large format style. The pictures were extracts of landscape, snippets of views and scenes, more ideas about the landscape than pictorial representations. I had noticed that they had a book for sale and put down a payment for it straight away. The book is a self published, no compromises effort. The oversize format added considerably to the cost but Angie and David were insistent upon giving the pictures the room to breathe on the page. There is very little narrative in the book, a short introduction by Julian Cooper opposite an appropriate photograph of a slate face in one of the many abandoned quarries that the Lakeland offers. A one page introduction talking of the history of our attitude to the Lakes and the wild in general and we're off into the heart of the book, well presented and printed photographs. Most of the pictures are presented one per spread on the facing page - ensuring very little bleed through in the pictures (i.e. you can't see the picture on the other side of the page bleeding through). And what pictures they are; you won't find many obvious near/far compositions, most of the pictures are either horizonless extracts or long distance views of the mountains and the weather. And what weather! The key to many of these pictures is the lighting - they spend hours in a location waiting for just the right conditions, suffering the elements inside a temporary tent until just the right moment occurs. At the back of the book we have a set of field notes that talk about the conditions when the photographs were captured and also what equipment the photographs were taken on (mostly 10x8 and 4x5 with the occasional Hassleblad square capture thrown in for good measure). The Lakes are often considered a spent force in landscape photography, somewhere that has been 'done'. Well it may be the case that most roadside pictures have been done and the major Wainwright paths have had an almost continuous stream of consciousness digital capture event happening on a daily basis, but get off the main tracks, move around the edges of the mountains and follow the streams and hill paths and you'll find a new world - one that only a tiny fraction of the landscape photography fraternity has seen. That most of these pictures have been taken in a 10 mile radius of their home makes me both extremely jealous and very impressed; obviously we can't all live in such amazing surroundings but we should definitely try to venture off the beaten path more often. This is not a cheap book, but is a highly recommended one if you are interested in seeing a different approach to landscape photography and another way of seeing the lakes. Oh, and this is just the first part in a two volume set, the Spring and Summer collection as it were. The next issue will be Autumn and Winter and I for one am really looking forward to seeing what follows. 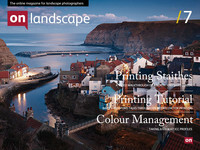 You can buy "Landscape for the Imagination" direct from Greenburn Publishing on their website http://www.greenburnpublishing.co.uk/ which also includes more of their work. Read their featured photographer interview and David's interview.